Holidays are supposed to be a wonderful time of the year, but sometimes something crazy happens. Be it funny or terrifying, I’m sure we have all had some sort of wacky holiday. No matter what, you’ll always remember it for the rest of your life. Most holidays are a little crazy because all the family gathers together under one roof. It can be a little hectic. I mean what other time of year can you see the family that you barely ever talk to except on holidays? Like for me, I only see my family from Florida during the holiday season. Crazy holidays happen in many different ways it could be as simple as a little mistake that could ruin the holiday, but it doesn’t always have to, for senior Chris Klobuchir that was the case. “On Christmas morning my family invited my older brothers and their families over. That morning we were getting everything ready. My mom decided to light one candle. We didn’t realize the curtain was a little too close to it, we carried on with our morning. My dad later pointed out he could smell smoke and noticed where the smoke was coming from. The one part of the curtain had burst in flames. Luckily my dad reacted fast and grabbed it by his bare hands to put it out.” Said Klobuchir. People react to these incidents in different manners but sometimes the reaction is more entertaining than the incident. Some people think the little things that happen are awful, but losing a pet is way worse. 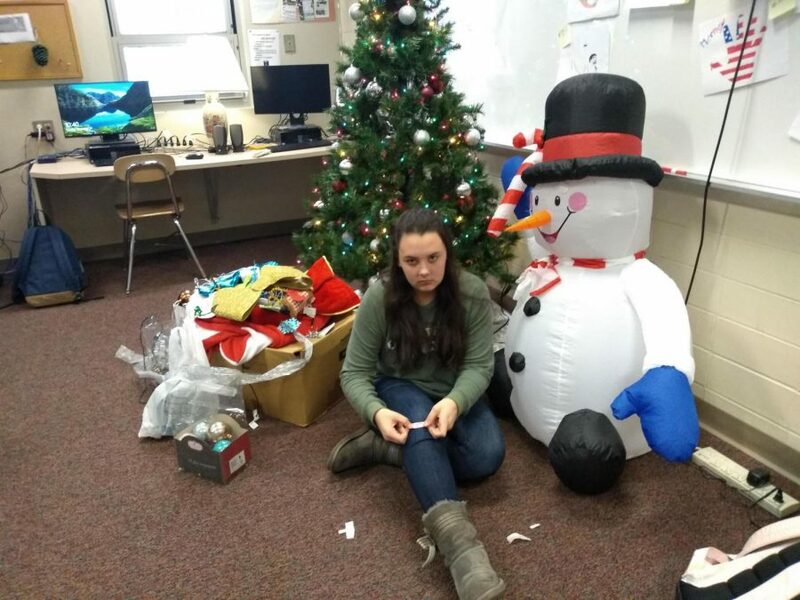 For junior Kam Grassi, it was a sad Christmas. “We were all very shocked and emotional,” said Grassi. It’s hard for everyone to deal with the loss of a pet but for younger children its rough. You would think a bunch of kids playing on a carpet floor would be harmless, but when sharp object hide in the carpet it can turn disastrous in an instant. For junior Chloe McAnallen, that’s exactly what happened. She was playing a game in the basement with her brother and her friend, and she slid on the ground. Something, was in the carpet.She felt like it was a brush burn but little did she know it was way worse than that. She then found out that she had cut open her knee and she was bleeding pretty bad. For an eleven year old that can be pretty terrifying. “It was really terrifying,” exclaimed McAnallen. It was a rough Christmas for her.